Sweet potato vine trail underneath a planting of lantana and ‘Victoria Blue’ salvia. I’ve spent a busy week on the road traveling back and forth throughout the central and northern parts of Arizona. While my road trips were for pleasure, there were some work elements involved, viewing the newest trends of high desert landscaping, and taking photos of pretty plants. Planters filled with green and black sweet potato vines trail over the railing at Tlaquepaque with Mark Twan (Samuel Clemens) sitting underneath. During the first part of the week, I spent a few days in Sedona. This colorful, high desert town holds a special place in my heart. It is where my husband and I spent our honeymoon, and we make a point of coming back up to visit every few years. A must stop destination for us are the shops are Tlaquepaque, which is modeled after an old Mexican village. Fountains and courtyards are scattered throughout the stores, inviting visitors to sit and enjoy the dappled shade while listening to the gentle sounds of water features. 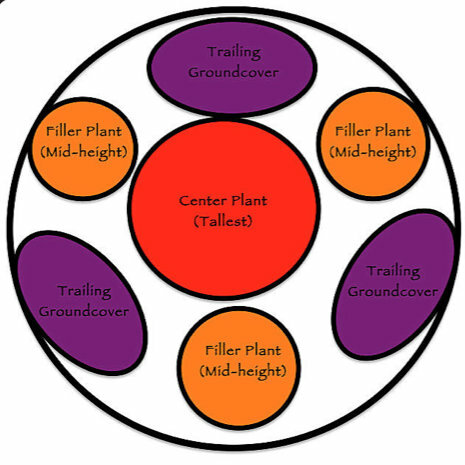 To be honest, I do enjoy perusing the galleries and shops, but the main draw for me is the beautiful container plantings. 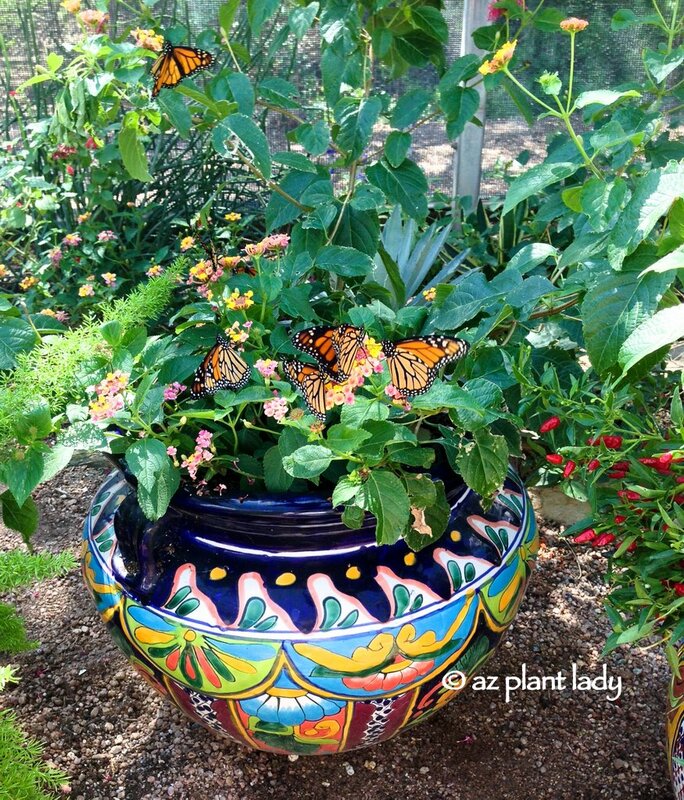 Sweet potato vine, lantana, ‘Katie’ ruellia, and salvia are artfully arranged within the containers. A ‘Painted Lady’ butterfly drinking nectar from a lantana. 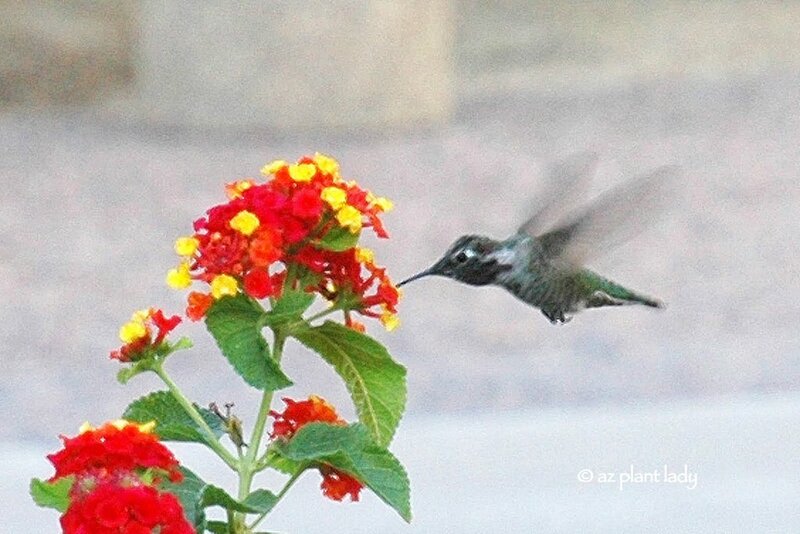 Butterflies and hummingbirds are also frequent visitors to Tlaquepaque. Area hotels also feature lovely examples of plants that thrive in the dry heat like the trumpet vine and yucca, above. While in Sedona, we made side trips to Flagstaff and Cottonwood before it was time to travel back home. After one night home, it was back into the car and off on another journey. This time, we brought our kids with us for a destination wedding in Skull Valley, which is a half hour outside of Prescott. The wedding was held in the middle of the wilderness, reached by traveling over 20 minutes on a curving, unpaved road. Wildlife was plentiful as we spotted a coyote, deer, and a roadrunner, while also smelling a skunk along the way. It was dusk when the wedding began, and the setting couldn’t have been more beautiful. A cool breeze welcomed guests to the venue that backed up onto the Prescott National Forest. The ceremony was beautiful, and the groom got all choked up in the midst of his vows. Guests spent a great time celebrating at the reception, held in an old barn, and we got back to the hotel late. We took a back way back home, which involved driving some curvy mountain roads, but we traveled through little towns that we had never heard of such as Wilhoit and Peeble Valley. I love the fact that even after living here for over 30 years, I still enjoy the beauty of our state and yet encounter new places. **Do you have a favorite place to visit in Arizona? I enjoy traveling – especially when I get to explore new places. Last month, I journeyed to Buffalo, New York where I toured gardens, attended a writer’s workshop, and best of all, spent time with one of my favorite people. Why Buffalo you may ask? Well, it turns out that this industrial city has beautiful green spaces, whimsical private gardens, as well as test gardens. Each August, the city hosts Garden Walk Buffalo where people from all over the U.S., Canada, and other countries descend to tour over 400 private gardens. I was in Buffalo for the Garden Communicator’s Annual Conference, which is held in a different city each year. 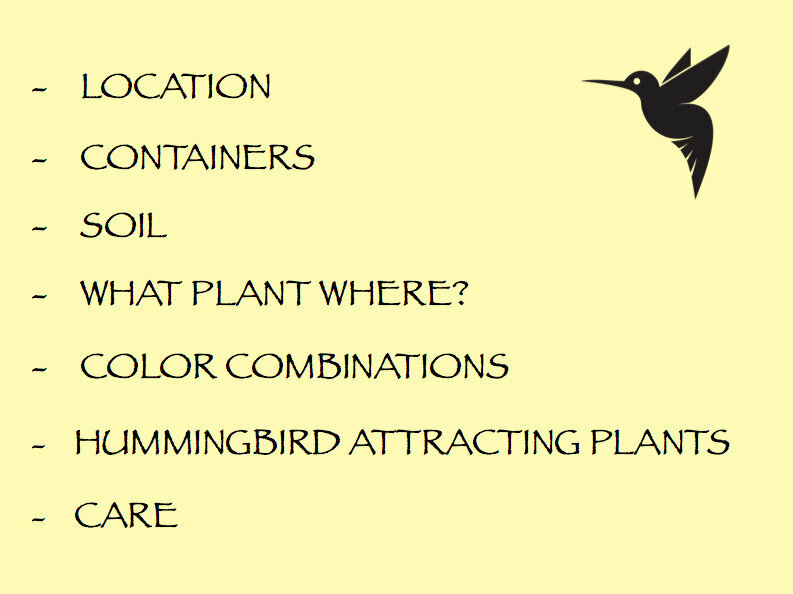 Each year, I look forward to the conference where garden tours, educational sessions, and the tradeshow fills our days. It is also a very good time to reconnect with fellow writers. I arrived in Buffalo a few days early to meet up with my BGF (Best Garden Friend), Andrea who flew all the way from Australia to attend. We met two years ago when we attended our first conference and bonded instantly. Throughout the year, we keep in touch via Facebook Messenger and look forward to spending a week together at the conference. Our agenda for the first day was to explore the downtown area down the street from our hotel. There were many older buildings, including our hotel, which had been beautifully refurbished, including the city hall and its art deco architecture. The day was sunny, humid, and hot. Desert dwellers like me don’t deal very well with humidity, but that didn’t stop us from exploring. We walked down to Canalside, which is along the banks of Lake Erie. As we explored the area, we walked through beautifully landscaped garden beds. The hosta and coleus were stunning with their contrasting colors. While I may not be able to grow many of the plants we passed by, it doesn’t keep me from enjoying their beauty and getting inspired to create similar plantings using different plants that thrive where I live. However, there was ONE plant in this bed that currently grows in my garden – pink flowering gaura. As we continued walking along the water front, splashes of color caught my eye. We had stumbled upon a ‘pot of gold at the end of a rainbow’ or in other words, a test garden where the latest flowering annuals are being tested. Large containers filled with ‘Supertunia’ petunias look as if they are on steroids. But, this type of flower is smaller than regular petunias and flower more abundantly as you can see. The tall spikes of white and purple angelonia add a lovely vertical accent. 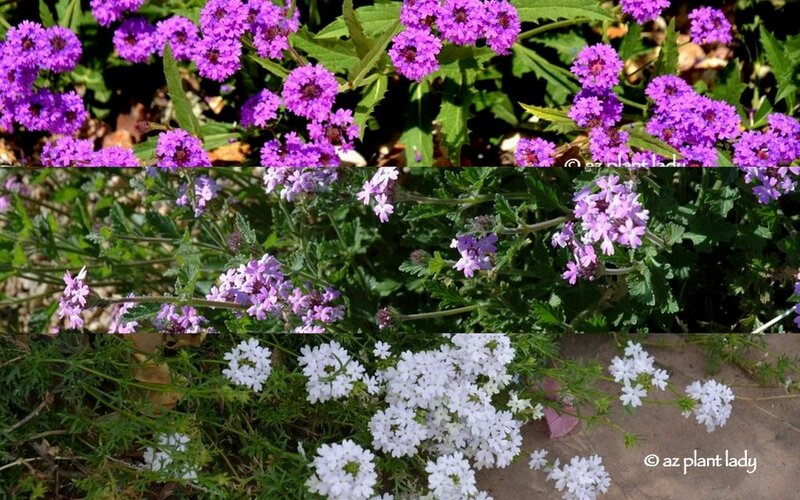 White alyssum, black sweet potato vine, and gomphrena make a unique grouping that works. I was thrilled to note that many of the plants in the test garden would grow nicely in my desert garden – during the cool season. More pink gaura was to be seen, blooming in front of masses of Supertunia. Lantana is a very familiar sight in arid gardens where it can survive outdoors throughout the year. However, in cold winter regions, it is treated as an annual. Black-eyed Susan vines grew against a wooden fence surrounded by vibrant verbena and double petunias. I love trellises made from natural materials on hand like this wood, likely fished out from the lake. 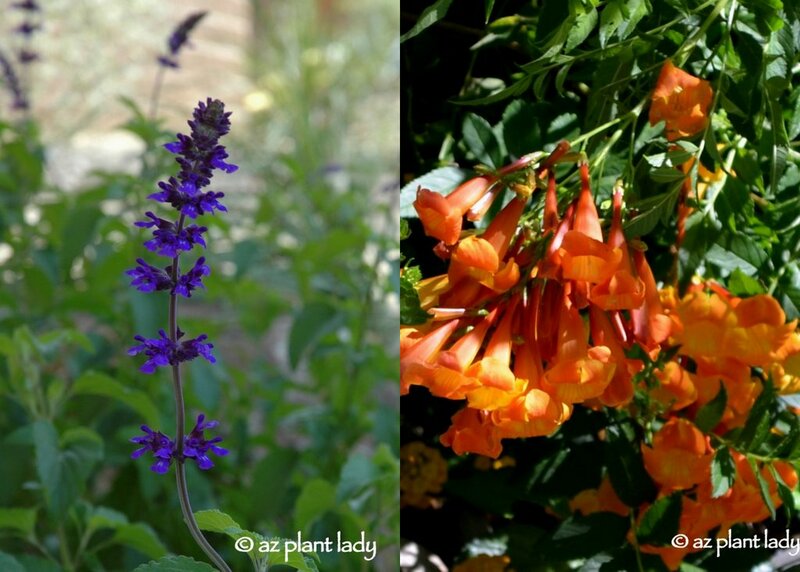 Here is another plant that currently grows in my desert garden – Salvia amistad. After the long trek from our hotel and exploring the test garden, Andrea and I were content after seeing such beautiful plants, but we were also hot, tired, and hungry. Thankfully, we found this wonderful restaurant a couple of blocks away. The food and service were fabulous, so we came back again for dinner. 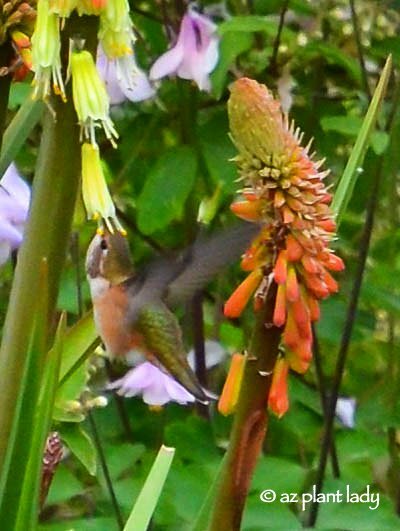 I invite you to visit Andrea’s blog where she writes about her adventures gardening in Perth, Australia. Please come back to join me for day two of our adventure where we discover another garden – this one filled with edible plants along with whimsical garden signs.